A free utility for modern microprocessors, displaying the usage for all their cores. It continuously reads each logical processor's usage, showing the data on big dials, as analog hand rotation and numeric percentage. It also offers you general information about your microprocessor (brand, type, speed). Now it's very easy to have a dynamic overview of your processor's performance when running tasks on all its cores. The program's window can be dragged anywhere on the screen and placed on top of other programs with a selectable opacity value. It snaps to the screen corners and edges, but if during movements the Shift or Control key is pressed, this magnetic behavior is temporarily disabled. Desktop computer, laptop or tablet PC, and an Administrator account. Due to the code optimization, it does not significantly load the processor (under 1% on Intel 2Ghz). For slower computers, 'small size' and 'show usage' can be disabled, a lower FPS value set in order to decrease the load. A right mouse click on the dials brings you the utility menu, where you can select any of the program options, visit this program page or minimize it to tray. Style: allows you to arrange the dials on rows or columns, fitting your screen dimensions. Size: a half size window can be selected, but the utility load increases a little bit. Display: a selection between a single dial showing the average processor usage or a dial for each logical processor your CPU has. Scale: a simple dial scale can be displayed or not. Hand: if color is selected, the hand will turn orange when the usage value is greater than 50% and will turn red over 75% to 100%. Number: shows the core number or not. Usage: shows the usage as numeric percentage or not. Speed: the hand movement can be updated with up to 20 frames per second. Opacity: the program's window can have several opacity values, from 10% to 100%. Stay on Top: the program's window can be displayed in front of other applications or not. Auto Run: allows the application to be automatically launched on Windows start. Help Page: when connected to the Internet, you are directed to the program webpage. Minimize: it minimizes the program to the tray. About: shows the window below. Exit: closes the CPU utility. All the program settings, as well as its screen coordinates, are automatically saved on exit and loaded on the next launch. CPU Brand: this identification is available on modern Intel and AMD processors. CPU Type: a system data showing the number of cores (threads for hyper threading models), and the 32 or 64-bit processor architecture. 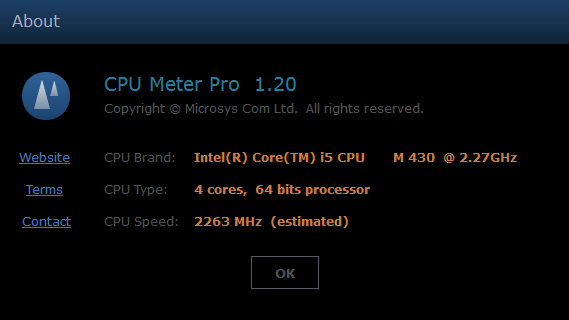 CPU Speed: a software computed value of the processor speed, normally equal to the manufacturer's specifications; it may differ if the speed stepping function is activated. the average CPU load is always displayed as numeric percentage in the bottom line.